Explore and enjoy the season with winter-related science and one of the museum's longest-running traditions—Igloo Build. From tracking animals in the snow to experimenting with ice, it will be a day filled with hands-on winter activities, including one of the museum’s longest-running traditions— Igloo Build. Learn how to build an insulated, sturdy house strong enough to support the weight of a polar bear. 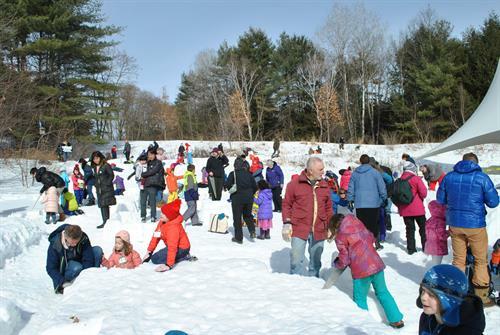 Dubbed the #1 Way to Winter Fun by Yankee Magazine (Jan ’09) and a “Top 10 Winter Event” by the Vermont Chamber of Commerce (2014/2015), the Montshire’s Igloo Build is guaranteed fun for the whole family. Dr. Bert Yankielun, engineer and author of the book How to Build an Igloo and Other Snow Structures, will be on hand to offer a demonstration, as well as instruction on the structural secrets of building with snow—from making an initial snow angel to placing the final block on the dome and sawing your way out. At 10:30am, Dr. Yankielun’d will provide a quick lesson on how to build an igloo, and will be on hand to assist igloo-builders with the process. Igloo Build \\ 10:30am–2pm \\ Hughes Pavilion in David Goudy Science Park: Learn about igloos while working together to build a sturdy house using nothing but water and hand saws. Winter Snowshoe \\ David Goudy Science Park Patio: Explore the winter trails in snowshoes and even put your newfound tracking skills to the test.